Electricity crisis: whom to blame? Electricity crisis is shaping up to be the defining political issue in Bangladesh. That’s a good thing, because energy shortage is among the most important bottleneck facing the country’s economy. It’s far better that politics reflect economic priorities than futile debates about dead men’s place in history. Of course, politics being what it is, it’s inevitable that there would be blame games. The Awami League government blames the past two governments for the current energy crisis. According to the government account, electricity wasn’t added to the national grid under the BNP and 1/11 governments. Meanwhile, about a year ago the opposition leader asked the government to resign if they couldn’t deliver electricity. the most recent slump started under the 1/11 regime. Note that I don’t take a position on the policy options to solve the crisis — that discussion requires technical knowledge that I don’t have. The regular reader wouldn’t be surprised to see a bunch of charts. 🙂 Good people at CEIC Asia database provides monthly data since July 1993. Unfortunately, the data is available with considerable lag, and the latest datapoint is April 2009. 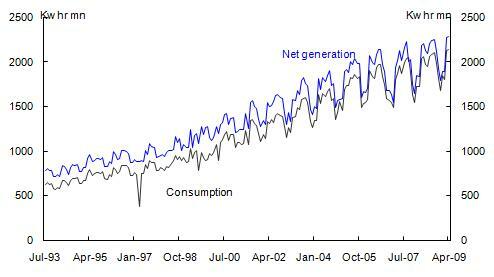 This first chart shows electricity consumption and net generation. Two things stand out: there is a strong seasonal pattern; and it seems net generation is keeping pace with consumption, so one can wonder what the big deal is. Gross generation is what is produced at the power plants. Station Service is a fraction (about 5-6%) of gross generation that is used in running the plant. Individual Production is what comes out of private generators. The chart below shows the smooth version of all these components. Two things are evident: individual power production took off between 2000 and 2003; and gross generation slumped around the same time. Governments cannot take any credit for the electricity that comes out of people’s private generators. In fact, one could argue that those private generators are needed because the power plants adding to the national grid fail to do their job. For our purposes, the series to look at is the gross generation. Suppose gross generation grew by 6% a year — this would mean electricity keeping pace with the economic growth we have experienced in the past decade. In the chart below, the green dotted line shows this hypothetical generation. The difference between this series and the red actual is the gap or deficit that’s behind the current crisis. 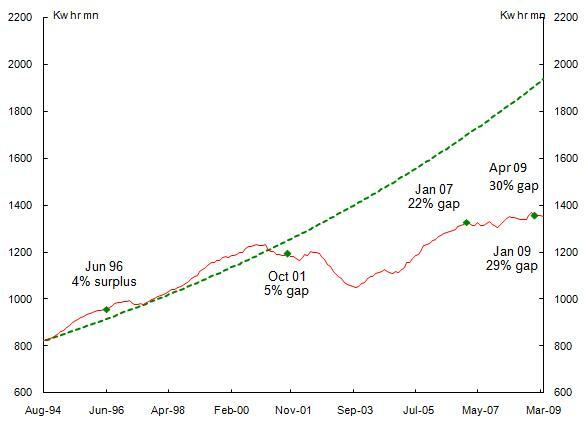 In the 1990s, gross generation actually grew faster than 6% a year, and the red line was above the green line. In fact, when the Awami League came to power in June 1996, by this measure they had a 4% surplus electricity. They maintained the surplus until the end of the decade. But something clearly happened around November 2000, and gross generation slumped. When BNP took power in Ocotober 2001, it inherited a 5% electricity gap. Here is then the first round of blame: AL left BNP with a 11 month long slump that resulted in a 5% deficit in electricity. Then the slump worsened in BNP’s first two years. In October 2003, when the generation hit its nadir, our power plants were producing the same level of electricity they generated over five years earlier! Things improved thereafter, and for the remainder of BNP’s term generation grew at 7.5% a year. But this wasn’t enough to close the gap that had already opened up. The October 2001 level of production wouldn’t be reached until August 2005. The November 2000 peak wouldn’t be crossed until January 2006. When BNP was kicked out of office in January 2007, the electricity gap stood at 22%. Here is the second party for blame: BNP left office after widening the deficit by 17ppt. Sure, the AL’s claim of ‘BNP not adding a single kw’ isn’t literally true. But the underlying story isn’t false either. However, in its defence, BNP did start a turnaround. Look what happened under the 1/11 regime. 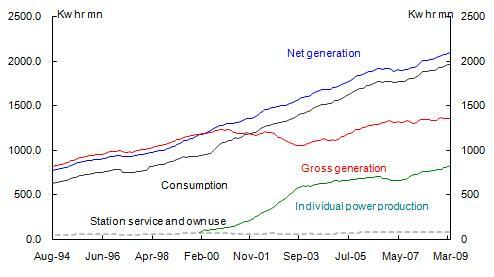 In its two years together, gross generation grew by barely 2.1%! The gap widened by another 7ppt to 29%. If you blame BNP for ‘not adding anything to the national grid’, spare some of your wrath for the good gentlemen who ran the show after Iajuddin was shown who the boss was. Thus, when AL took office again in January 2009, the gap was 29%. When our series ends in April 2009, the gap had widened to 30%. Judging by the continued crisis, the gap hadn’t substantially closed in the past year. In a sense, this kind of chartwaving misses the point. AL is in power now, and it ‘owns’ the electricity problem. To its credit, it has repeatedly promised, with quantifiable targets, to end the crisis before it faces re-election. Regardless of what had come under BNP and the 1/11 regime, AL will be held to account on these promises. And they should be. But it’s also the case that they had been dealt a rotten hand by both BNP and the 1/11 regime — something we will all do well to remember. Excellent Read … it would have been nice to get some of your views on how to resolve this crisis. I know blaming the Govt (AL or BNP) alone won’t benefit. Diganta, to have an informed opinion on various options to resolve the crisis would require technical knowledge. I’m afraid I simply don’t have that knowledge. If an engineer tells me that we should have a dozen coal-fired plants in North Bengal, and another says let’s build a nuclear power plant in Comilla, and yet another says let’s build a dam in Kaptai — I don’t think I’d be able to make a call on which is the best course. But the politics of it from here on is this: AL has made repeated, quantified commitments. So they will come up with a solution out of self-interest. Irtiza, here’s hoping to that. Jyoti Bhai, what about the quantifiable claims that not a single MW of electricity was added to the grid during the BNP tenure? This line has been parroted by Sheikh Hasina and her cabinet ad nauseam for the last three months. Can we call her out on her lies? This article also gives an overall picture from 1962 to 2007. Excellent and informative link. thanks. Absolutely. As I said, ‘the AL’s claim of ‘BNP not adding a single kw’ isn’t literally true’. So we can call them out on their lies. Sure. Dilbor, thanks for the link. 1) 1/11 regime was not required, or authorised, to solve the power problem of BD, their responsibility was to revise the election process (and review the corruption crisis). They did their job exceptionally well – far exceeded the performance of any al-bnp govt. 2) when bnp was in power, AL made every effort to sabotage national development, with hartals and dysfunctional parliament. Now with AL in power, BNP is repeating the same. Instead of being a healthy productive govt, with AL & bnp we have 2 parties that act like foreign hostile groups each trying to SABOTAGE the development of the other. The blame must go to BOTH al & bnp, for the disaster in power & national devt. Neither AL nor BNP is excusable for this crisis, they are both equally incompetent and responsible. The overwhelming obsession and brainwashing with Mujib-Zia, and disregard for national interest, by BOTH incompetent parties are to blame for this shame. 1. Judging from the rhetoric about Obamacare, it seems that blanket statements crowd out nuanced, quantitative arguments even the greatest republic in history. 2. Even blanket statements that can be verified is better than nauseating vulgarity about political opponents. During the CTG period, I remember reading that reports about how they managed to reach maximum production ever. My sense was that they were able to maximize production with existing infrastructure. So i would i like to a graph that shows changes in power production capacity with time along with amount of electricity produced over time (which you already have). 1. Did the government utilize the existing resources compared to capacity? 2. What steps did each government take to increase power generation capacity? 3. When evaluating each govt, there should be a lag time because construction of power plant started during the middle or end of the term is likely to be completed during the next term. The same applies to extraction of gas and coal. * In addition we need to look at availability of gas in power station, because poor gas supply is a factor that is preventing power generation to max capacity. In this regard we also to look at each government role in increasing supply of gas and coal. For example the politicization of phulbaria project… you can win elections with this kind of disruptive politics, but you ruin the energy security of the country. Energy security should be beyond politics, but it is victim of political kickbacks and shady companies in our country. Regarding the CTG, there is no doubt in my mind that they did poor job in adding new infrastructure, but the business climate, recession and fact that they are unelected prevented them from making major policy decision. So I am unwilling to give them more blame. Projects started by BNP should ideally started to mature during the CTG regime… but I guess nothing happened. Regarding the slump in power generation from 2001 to 2003, I think AL tried to sign multiple deals at the end of their term in a hurry, the BNP govt cancelled them because they claimed it was a political deal. So both parties are to blame. Besides lack of increase in production capacity from 2001 to 2003 can be largely be attributed to what AL did in prior years and how BNP supported them after they came to power in 2001. Cricket_pagol, it would indeed be very useful to see a production capacity chart. Unfortunately I don’t have that data.